Would you like a loyalty card? Purchases with loyalty cards are subject to conditions. - 10% off your second order*, available for items or total of items £10 or higher. - 20% off your 3rd, 4th and 5th orders, available for items or total of items £15 or higher. - 30% off your 6th order, available for items or total of items £25 or higher. - 50% off your 7th order, available for items or total of items £50 or higher. *"order": these promotions apply on orders made on the same day, regardless of the number of items you purchase in the same order. Once your card is full, we will automatically give you a new one. Same conditions apply for the new card. Please note that promotions and coupon codes apply to the price of the item(s). Postage is not included. It is totally free, with no expiry date and no commitment, but you must opt-in the programme if you are a new customer. eBay customers will be contacted when they make their first purchase. When you join the loyalty card program, we will send you (by email or a message on your eBay account) a link to a blog page showing your loyalty card with its number. 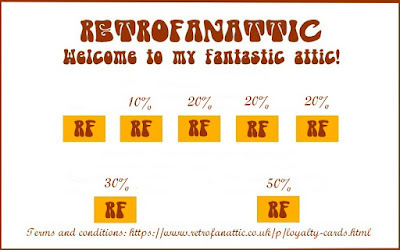 Your purchases on Ebay and on retrofanattic.com will be added to the same card, so every time you make a purchase on either website, your loyalty card will be updated. Your personal information will never be shown on the page, only your loyalty card number, and nobody else other than you and us can see or access your link. Once you have made a purchase, we will send you by email a coupon code for your next purchase. Ebay customers do not receive any coupon codes. They get a refund on their Paypal account or debit/credit card after they have proceeded to the checkout. These discounts apply to "Buy it Now" listings only, not to auction listings. Loyalty card discounts can not be combined with "Best Offers". Customers will be personally contacted when loyalty cards Terms and Conditions are updated. Please do not hesitate to leave a message when the service is closed. I will reply very quickly.